This white paper describes Gladinet Cloud Team Edition, an access solution that supports the BASIC use cases for online storage. As businesses migrate to online storage, more and more are experimenting with Dropbox, SugarSync and a bunch of other solutions. For various reasons, the solution you found wasn't exact matching your requirements and you ran into several problems. First problem is that for big data set, the initial sync takes forever to finish. Before it finishes, there is no easy way to collaborate on the data set. Second problem is that you ran into overlapping file editing and modification. There is no easy way to lock the files when modifying. Last but not least, you have file servers and you would like to see a more file server friendly product. The current solution you have are all very much focused on the desktop and laptop. Gladinet Cloud Team Edition solves these problems with a flexible, multi-tiered architecture. Drive Mapping Gladinet provides an different approach from synchronization based solution. Instead, Gladinet present to you a drive letter pretty much like the traditional C:, D: drive that you are familiar with. Within the drive , you can do direct random access, without waiting for the sync to finish. The drive interface is the main user interface while the sync functionality is in the background. File Locking File locking is possible with the Gladinet drive mapping technology. When you collaborate in a team folder, Gladinet can detect file editing event and notify other users at the earliest time. File Server Support Gladinet Cloud makes it possible to form a distributed file system over the Internet. Each file server can replicate local folder content to cloud and vise versa in the background. The desktop client and the file server agent client are optimized respectively for desktop and file server. To address these issues, Gladinet Cloud Team Edition provides the ability to attach an existing folder to online storage. 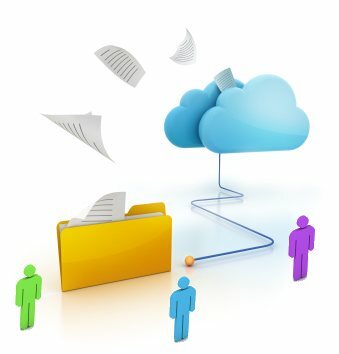 The attached folder’s contents will be synchronized with the cloud and a versioned backup will be maintained for each file in the attached folder, but even before the initial synchronization is completed, the entire contents of the attached folder can be accessed anywhere by any of the Gladinet clients. Gladinet Cloud Team Edition also provides a snapshot backup which supports the backup of open or locked files. Snapshot backups provide optimal efficiency since they only store the incremental changes once the initial snapshot has been stored. Gladinet Cloud Team Edition gives them the capability to access online storage from any device using native interfaces. Gladinet’s solution provides a mapped drive on PCs so that users can use familiar tools like Windows Explorer and Mac Finder to access files in their online storage. A big advantage of the Gladinet approach is that you can maintain your existing file tree hierarchy - unlike other solutions which require your existing directory structure to be refactored to a special folder. The Team Edition provides mobile applications for any iOS or Android device. Once installed, these applications allow native mobile device access to the Gladinet Cloud. For example, on an iPhone, the Gladinet Cloud application can be downloaded from the Apple store, configured with a Gladinet user name and password (which could actually come from active directory) and then used for direct access to files in the Gladinet Cloud or on an on-premise file server. Gladinet Cloud Team Edition provides several clients including Gladinet Cloud Server which is specifically designed for file servers. This client allows a file server to act as an online storage gateway providing clientless access to online storage through network file shares. It also allows existing file shares to be attached to online storage for instant access. Gladinet Cloud can be accessed from any modern web browser, such as IE, Chrome, Firefox, Safari and Opera. An explorer-like interface is provided and files can be dragged directly into the browser. Secure online collaboration is made possible through Gladinet’s tight integration with Active Directory. Any Gladinet Cloud Server instance can be used as a proxy by the Gladinet Cloud infrastructure to automatically sync user information from Active Directory. The user information is used to control authorization and access to shared content like team folders. Administrators can create shared workspaces with access controls using Team Folders in Gladinet Cloud. Once published by the administrator, a team folder will become accessible by every account user who has been granted access. Any folder in the Gladinet Cloud can be published as a team folder. This makes it possible to attach an existing folder on an on-premise file server to Gladinet Cloud, and then publish it as a team folder. With Gladinet’s AD integration, a user can therefore login to the Gladinet cloud with his existing Active Directory credentials, and then access the team folder remotely from a desktop, laptop or mobile device. And any changes made to the contents of the team folder will be protected by distributed file locking and synchronized across all locations. With the Gladinet solution, users can continue to use familiar paradigms like mapped drives, file shares and applications on their mobile devices to leverage online storage. If you haven't seen "Gladinet Cloud" in action, click the button below to sign up for a team edition account. It has 14-day trial that gives you direct experience of what it is.The sign up process is 3 minutes, so you can see it in action very quickly and evaluate it thoroughly.